Ricky Donison has won the second round of the JK Tyre – National Rotax Karting Championship in the senior max class. 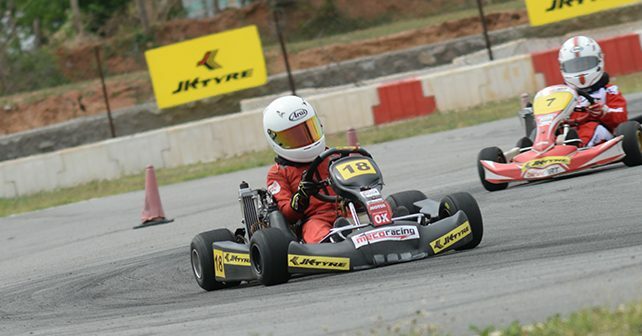 Yash Aradhya won in Junior Max class as Ruhan Alva claimed victory in the micro max category. In the second round of the National Rotax Karting Championship, Ricky Donison claimed his second win of the season at the Chicane circuit in Hyderabad in the senior. Ricky retired from the pre-finals after an incident with Mrinal Chatterjee. Despite starting from the back of the grid for his DNF in the pre-finals, Rickey took a stunning victory in the final race. Ricky climbed up the order and took the lead on lap 6, which he maintained to the chequered flag to claim his second win of the season. Former national champion, Vishnu Prasad finished in second place, while Dhruv Mohite finished third. In the Junior Max class, Yash Aradhya, had a disappointing first round. Yash made up by winning the race in round 2 after starting from pole, and leading all the way to the chequered flag for a dominant victory. Yash’s lead was never under threat through out the race, but behind him were battles for for the two remaining podium spots. Nirmal Umashankar, Chirag Ghorpade and Manav Sharma fought hard for the places. But Nirmal crossed the finish line in second place with Chirag piping Manav for third. Manav had the final podium spot in the bag until the very last lap, where Chirag made his move into turn 4 to take the place and finish on the podium. The micro max final turned out to be the nail bitter of the lot. Ruhaan Alva messed up the start in the final and fell back to fifth place. But Ruhaan pushed as hard has he possibly could and moved back up the order. On the fourth lap of the race, Ruhaan took the lead from Arjun S Nair by diving inside turn seven when Arjun had left the door open. Once in the lead, Ruhaan opened up a sizeable gap to take the victory. Arjun lost another place to Shahan Ali Mohsin to finish third, Shahan went on to finish second in the race after his pre-finals victory. Round 3 of the National Rotax Karting Championship will be held at the Kari Motor Speedway in Coimbatore from July 15-17.